Gwyn ap Nudd is a fascinating exploration of the ancient and mysterious figure of the same name. Bright god of the Annwfn, guardian of the underworld and psychopomp between the worlds, Welsh leader of the Wild Hunt and faery king, Gwyn ap Nudd is said to reside in the legendary glass castle on Glastonbury Tor as well as in the Y Mynyddoedd Duon (black mountains) of Wales. Stories of Gwyn ap Nudd are strewn through oral folklore and in medieval Welsh literature; author Danu Forest encountered him first many years ago and offers this book “in service and with gratitude”. 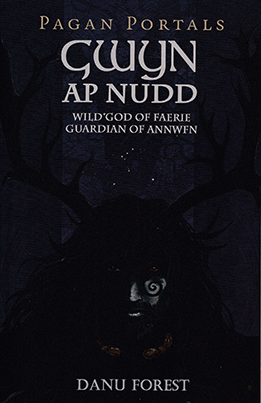 Gwyn ap Nudd is part of the Pagan Portals series from Moon Books – a classification aimed to provide an introduction on a specific subject. However, author Danu Forest has managed to cram an amazing amount of information into this concise, well researched and very accessible book. Each chapter also contains suggested practical exercises and meditations, providing guidance and opportunities for personal practice and exploration. Gwyn ap Nudd is also wonderfully illustrated with black and white drawings by the very talented Dan Goodfellow. A pleasure to read, chocked full with ancient tales and offering suggested interpretations of ancient mythologies, Gwyn ap Nudd will be of great value to anyone interested in the Brythonic as well as those seeking wisdom and rapport with the wild and dark aspects of the land on their quest for self-knowledge and Awen. Highly recommended! Review Details: Gwyn ap Nudd was reviewed by June Kent, Editor of Indie Shaman magazine and published in Issue 35.